I’ll be honest: I used to think SEO was kind of slimey. I associated it with guys with slicked-back hair who call themselves “keyword ninjas” and really, really want you to sign up for their email newsletter. It’s easy to think that, as a nonprofit doing pressing work, you just don’t have time for the weird and dirty tricks that SEO involves. 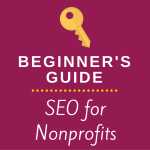 SEO is for everyone–even nonprofits. After all, you want as many people as possible to sign your petitions, watch your videos, download your reports, and donate to your organization. Turns out, that’s not the case. SEO is for everyone–even nonprofits. After all, you want as many people as possible to sign your petitions, watch your videos, download your reports, and donate to your organization. If they can’t find your website, it’s a lot harder for them to do that. There are a few easy, free tools that you can use to improve your nonprofit website’s SEO–with no use of the word “ninja” required. SEO stands for Search Engine Optimization. Simply put, it’s a way to make search engines better able to understand what your website is telling the world. That way, the people who you you want to see your content are actually able to find it when they search Google, Bing, Yahoo, or whatever other search engine they prefer. It’s about anticipating the words that your audience naturally uses to search for your topics, and putting those words on your website in a way that search engines can read. Good SEO isn’t about loading your content with trending keywords that aren’t particularly relevant to your work. Instead, it’s about anticipating the words that your audience naturally uses to search for your topics, and putting those words on your website in a way that search engines can read. When it comes to search engines, Google towers over its competitors (in one survey, 80% of respondents called it their primary search engine). So it’s no surprise that they also offer some heavy-duty SEO tools. Your best first step is to ensure that your organization’s website is linked to both Google Analytics and Google Webmasters Tools. Google Analytics can tell you what percentage of your current traffic is coming from search engines, and the paths that users follow on your site (along with lots of other useful info!). Google Webmasters Tools can tell you what terms people searched for to get to your site, and which of your pages they clicked in those searches. Google Webmasters Tool will also flag any major errors your site has, which you can then click through to fix. We’ll be posting in the weeks to come with more info about using Google Analytics and Google Webmasters Tools for SEO, so watch the blog for more info on that. Now that you’ve connected to Google Analytics and Google Webmasters Tools, you might be wondering what’s next. Here are a few quick tips that can be easily implemented, and that will improve the appearance of your website on search engines. Come up with a list of search terms your desired audience might be using. Try to think of several different options for the same ideas (“are whales endangered” and “how many whales left”) and write them down. Then use keyword tools (like Keyword Planner, or Keyword Explorer) to see which terms have robust search traffic. Be specific with your terms. If you’re an LGBT advocacy organization, the term “gay” does get a lot of traffic. But it’s so broad that you have tons of competition to appear in the top three pages of results, and the people searching for a term that broad aren’t necessarily your desired audience. If you have a specific campaign around bullying in NYC school, try “NYC gay school bullying” instead. Once you’ve chosen the specific campaign terms with relatively high search traffic, ensure that your content includes those terms. Don’t force terms where they don’t belong, but do use the terms that people actually search for to describe your content. Make sure that your header, title, and URL match those desired terms. Also try to have the term used to describe an image on the page (for Google Image searches), and somewhere in the content of the page. Create a sitemap. There are plenty of places to create free sitemaps (here’s one). Sitemaps can be uploaded to Google Webmaster Tools, and provide Google with a better understanding of the structure of your site. Internally, they’re also helpful when preparing for a redesign, so that you can map out which pages to maintain, which to set up with redirects, and just get a good sense of the architecture of your site. When it comes to SEO, this is just the tip of the iceberg. We’ll be writing more about using Google Analytics and Google Webmasters Tools for SEO on this blog, but there are also lots of resources across the web. The Moz blog is a good place to start, and KISSmetrics also has useful resources. But the most important thing is to just dive in! The root of what you’re doing is making your website more accessible to your supporters–and you should know your supporters better than anyone. Want to go further with SEO than just the basics? We’re happy to help. Shoot me an email at [email protected], and we can chat about your options!